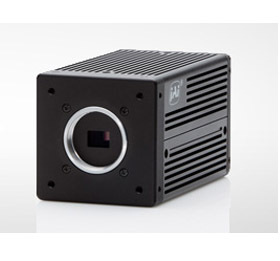 The AD-131GE provides 1.3 megapixel monochrome resolution for high dynamic range imaging applications. The camera leverages JAI’s advanced prism technology to align two 1/3″ CCD sensors (ICX447AL) to within one-quarter pixel accuracy. By altering the shutter/gain settings of the two CCDs and fusing the two synchronized video streams, the AD-131GE can provide more than double the dynamic range of standard CCD cameras (up to ~120 dB) but in a linear fashion that avoids the noise, shutter, and compression issues found in typical CMOS-based logarithmic or LinLog™ high dynamic range cameras. Alternatively, the timing of each CCD’s readout can be offset by one-half frame and interleaved together to produce 62 fps output without the image degradation that would result from over-clocking the CCDs. The AD-131GE is equipped with a variety of trigger modes including a special 3-shot PIV (Particle Image Velocimetry) mode (download PIV technical note for more details).